If you were curious about the Wedel et al. 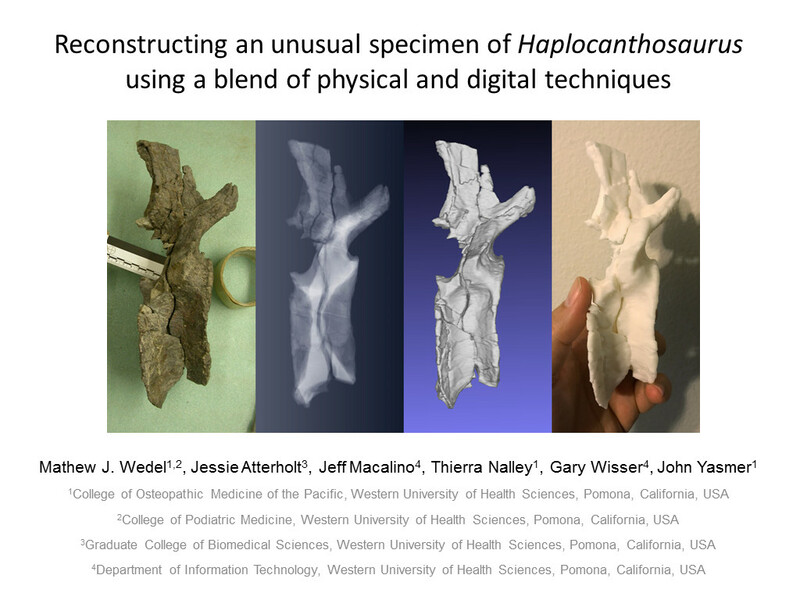 presentation on the Snowmass Haplocanthosaurus at the 1st Palaeo Virtual Congress but didn’t attend the event, it is now preserved for posterity and freely available to the world as a PeerJ Preprint (as promised). Here’s the link. 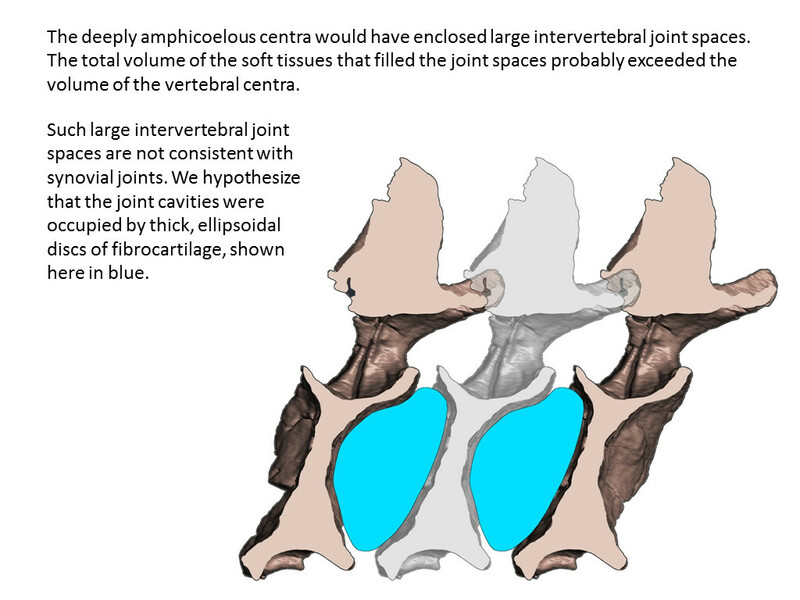 I’ll have much more to say about this going forward, but for now here are slides 20 and 21 on the intervertebral joint spaces. This is obviously just the same vert cloned three times and articulated with itself. 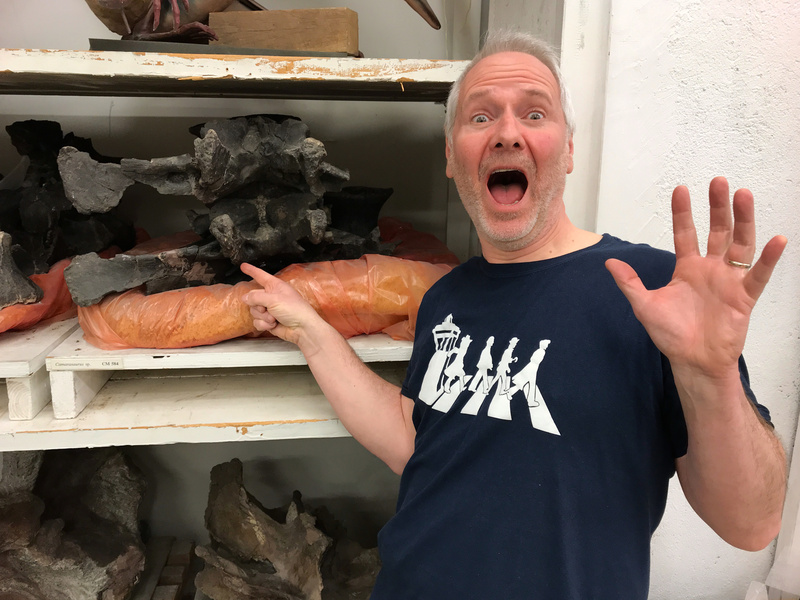 With the digital rearticulation of the reconstructed and retrodeformed caudal series still in progress, we cloned caudal 3, the only vertebra that preserves both sets of zygapophyses, to get a rough estimate of the sizes and shapes of the soft tissues that filled the intervertebral spaces and neural canal. The reconstructed intervertebral discs (in blue) are very crude and diagrammatic. 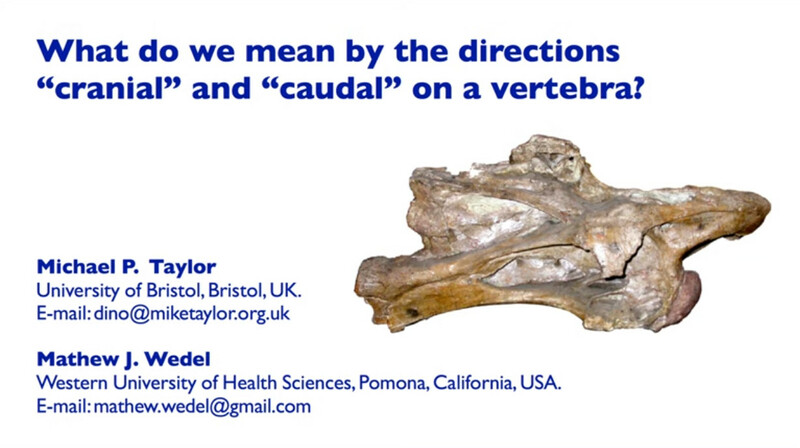 The reason I’m putting these particular slides up is to get the cited references out in the open on the blog, to start correcting the misapprehension that all non-mammalian amniotes have exclusively synovial intervertebral joints (see the discussion in the comments on this post). In the list below I’m including Banerji (1957), which is not cited in the presentation but which I did cite in that comment thread; it’s an important source and at least for now it is a free download. These refs are just the tip of a very big iceberg. 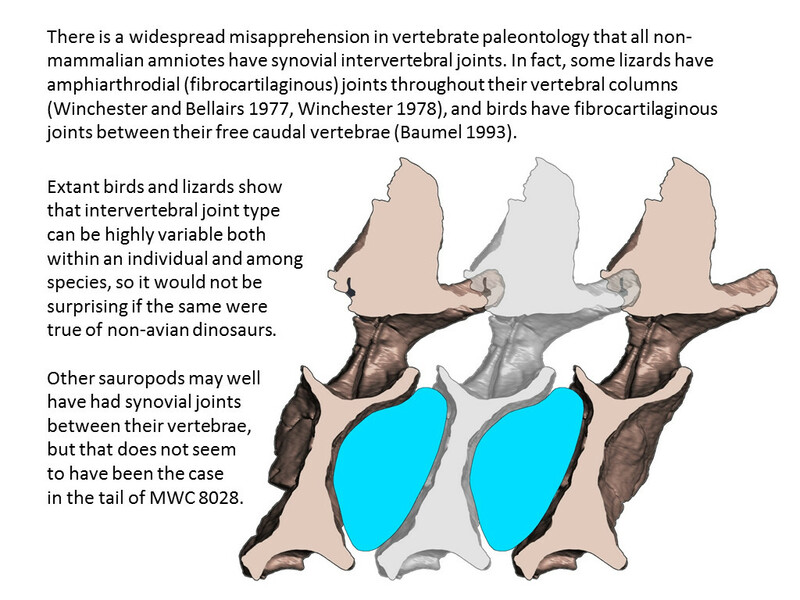 One of my goals for 2019 is to do a series of posts reviewing the extensive literature on amphiarthrodial (fibrocartilaginous) intervertebral joints in living lepidosaurs and birds. Stay tuned! Baumel, J.J. (ed.) 1993. Handbook of Avian Anatomy: Nomina Anatomica Avium. Nuttal Ornithological Club, Publication No. 23, Cambridge, Massachusetts, USA. Banerji, K.K. 1957. 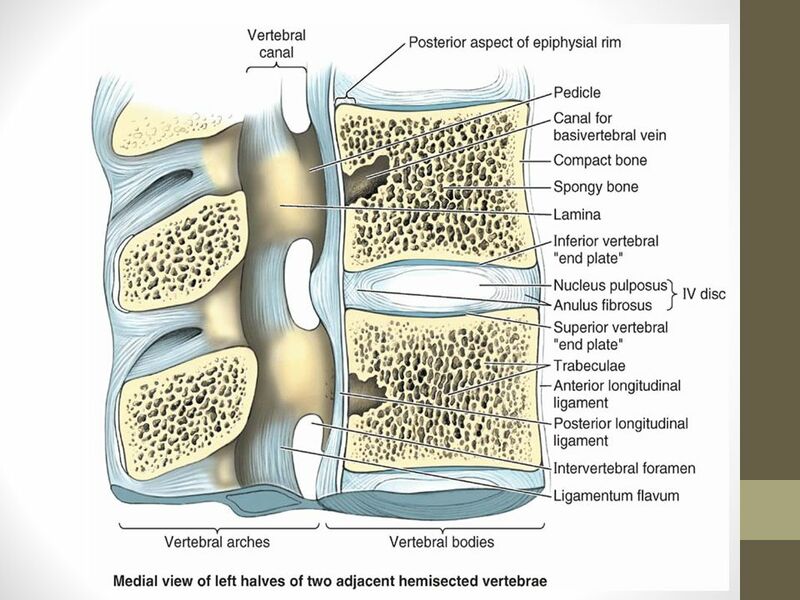 The comparitive anatomy of the intervertebral joints. Doctoral dissertation, University of St Andrews, 132 + viii pp. Winchester, L.A. 1978. 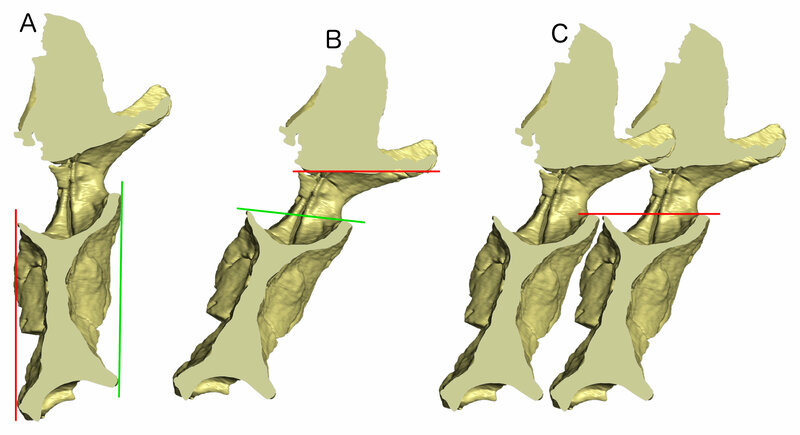 Development and morphology of vertebrae and intervertebral joints in lizards and snakes. PhD thesis, Imperial College London, 326 pp. 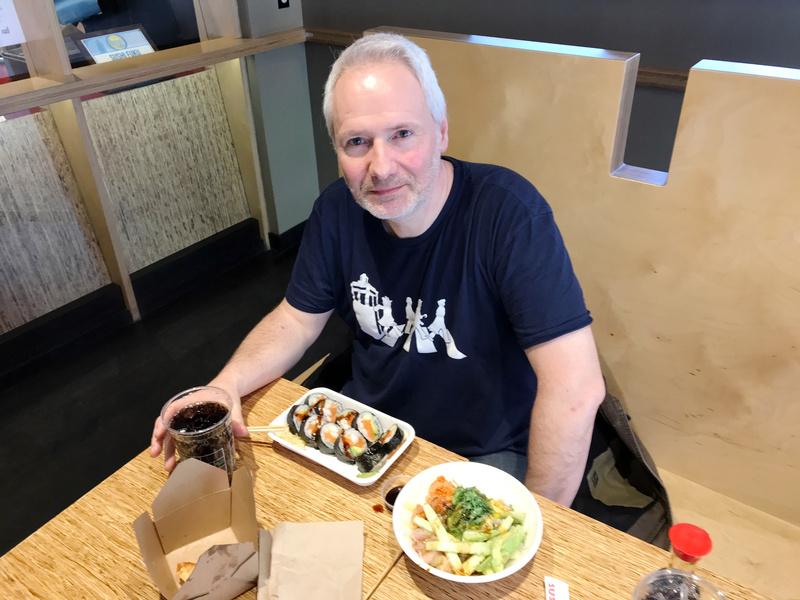 Winchester, L.A., and Bellairs, A.D.A. 1977. 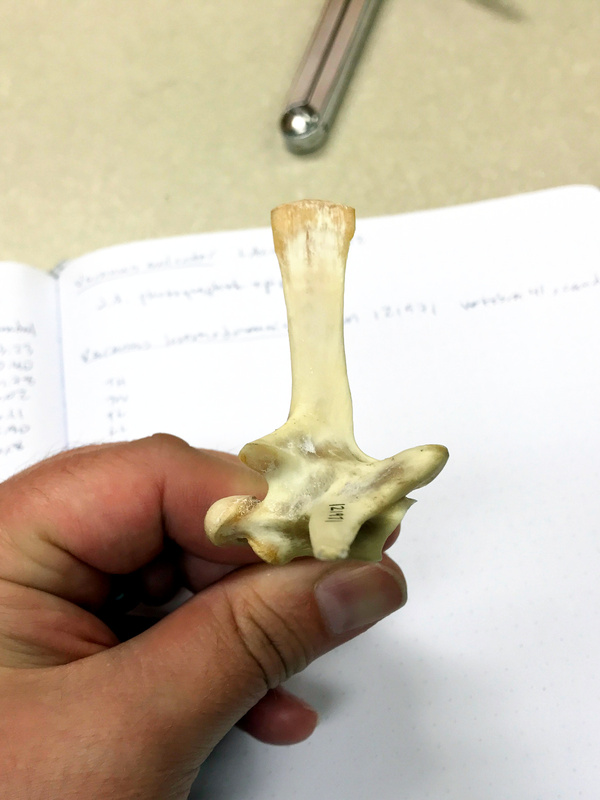 Aspects of vertebral development in lizards and snakes. J. Zoology 181(4): 495-525. 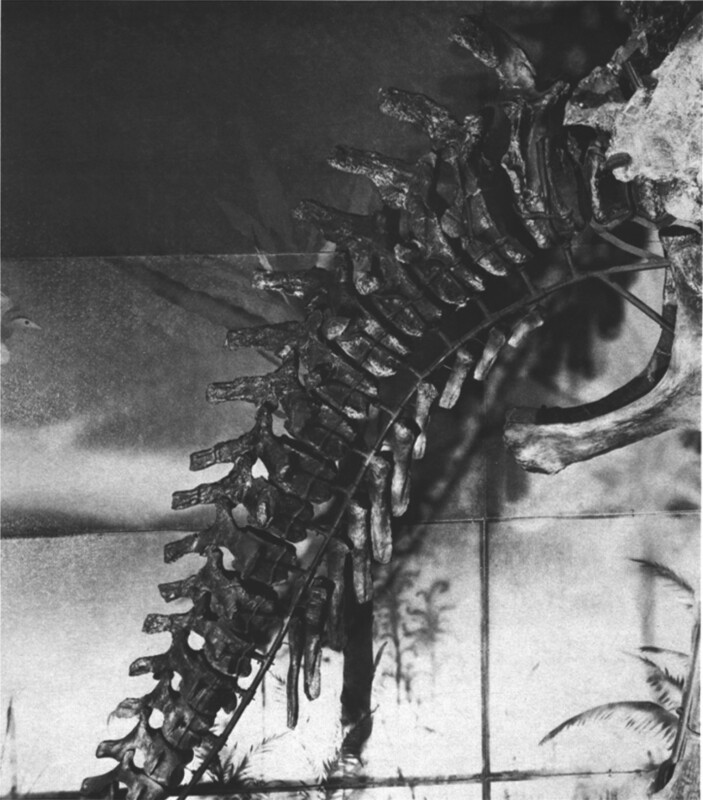 Here’s D10 and the sacrum of Diplodocus AMNH 516 in left lateral and ventral view, from Osborn (1904: fig. 3). Note how the big lateral pneumatic foramina, here labeled ‘pleurocoelia’, start out up at the top of the centrum in D10 and kind of pinch out up there, seemingly entirely absent by S3 (although there is a suspicious-looking shadowed spot above and behind the sacral rib stump labeled ‘r3’). 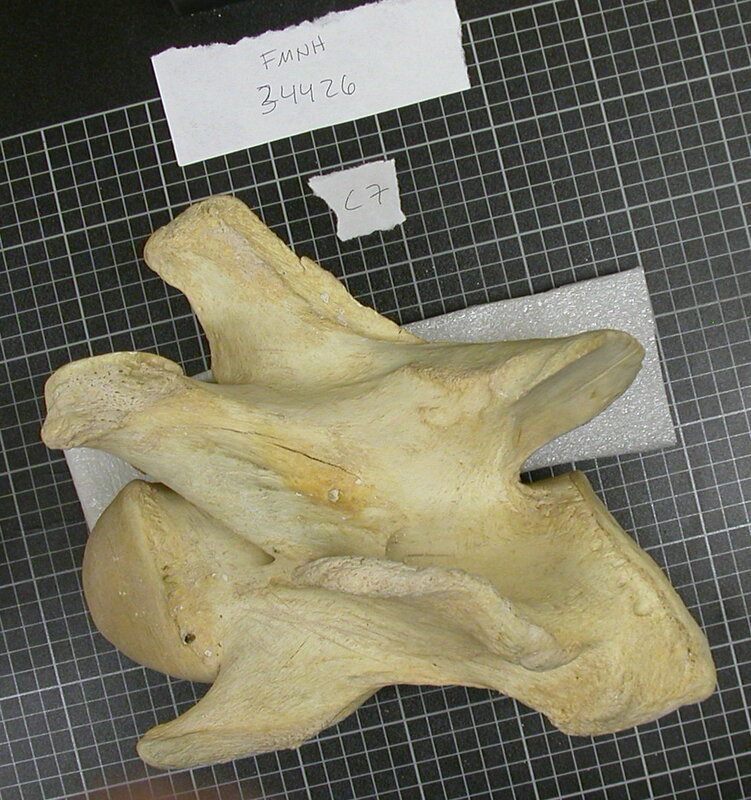 Then on S4 and S5 the big foramina are back, but now they’re low on the centrum, ventral to the sacral ribs. 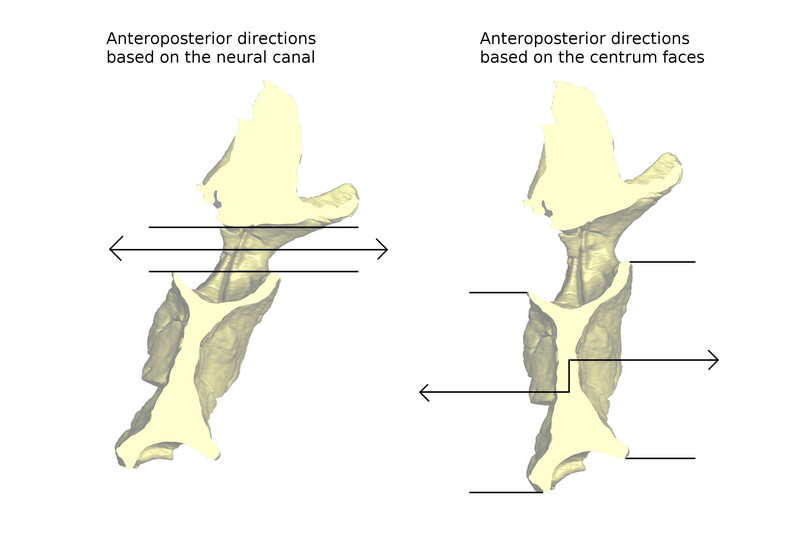 In ventral view, the foramina on D10, S1, and S2 aren’t visible–they’re both over the curve of the centrum, and in the case of S1 and S2, obscured by the sacral ribs. But in S4 and S5, the big lateral foramina are visible in ventral view. I’ve been interested in a while in this seeming hand-off in centrum pneumatization from dorsolateral, which prevails in the dorsal vertebrae, to ventrolateral, which prevails in the posterior sacral and caudal vertebrae. 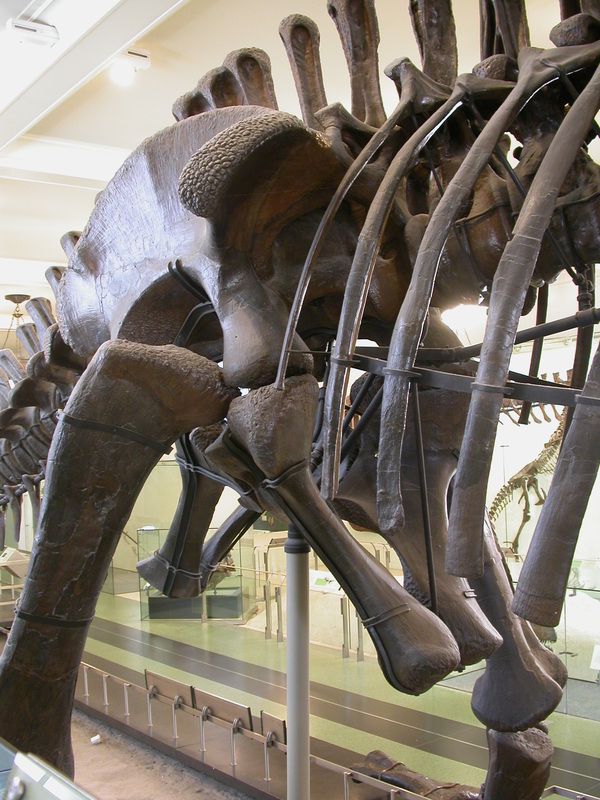 Almost all sauropod dorsals have the pneumatic foramina quite high on the centrum, sometimes even encroaching on the neural arch. 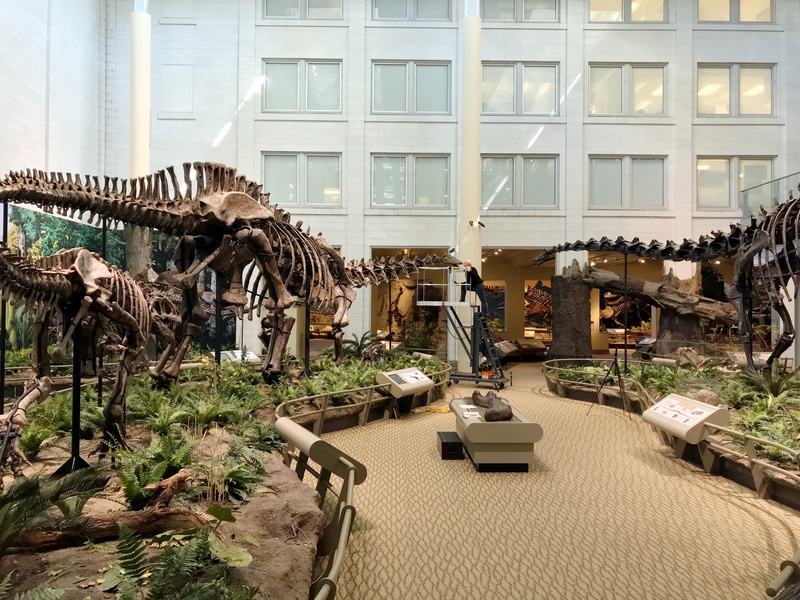 But if sauropod caudals have pneumatic fossae or foramina on the centrum, they’re usually quite low, and almost always below the caudal rib or transverse process (there may also be pneumatic fossae on the neural arch and spine)–for evidence, see Wedel and Taylor (2013b). To me this implies two different sets of diverticula. I think that in part because sometimes you get both sets of diverticula acting on a single vert. 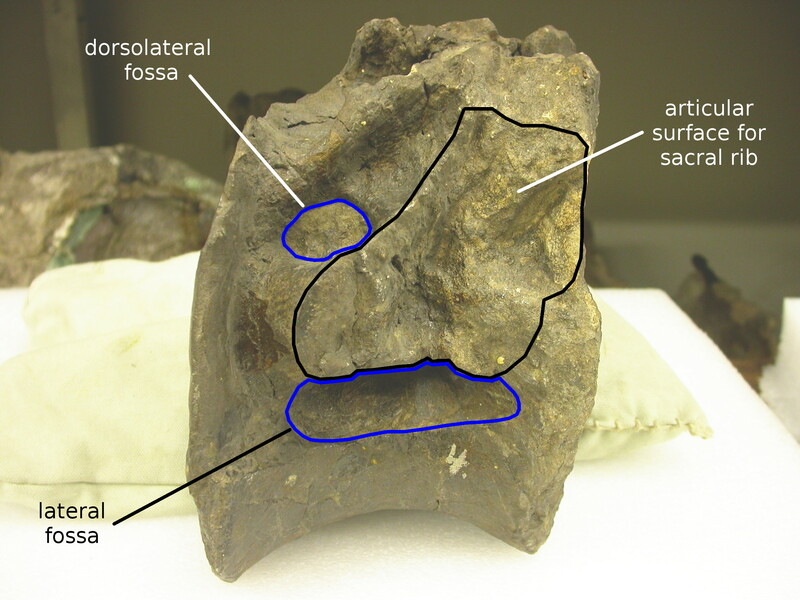 Here’s the centrum of sacral 4 of Haplocanthosaurus CM 879 in right dorsolateral view; anterior is to the right. Here’s the same thing annotated (yeah, it does look a little like an Ent who is alarmed because his left eye has been overgrown by a huge nasal tumor). 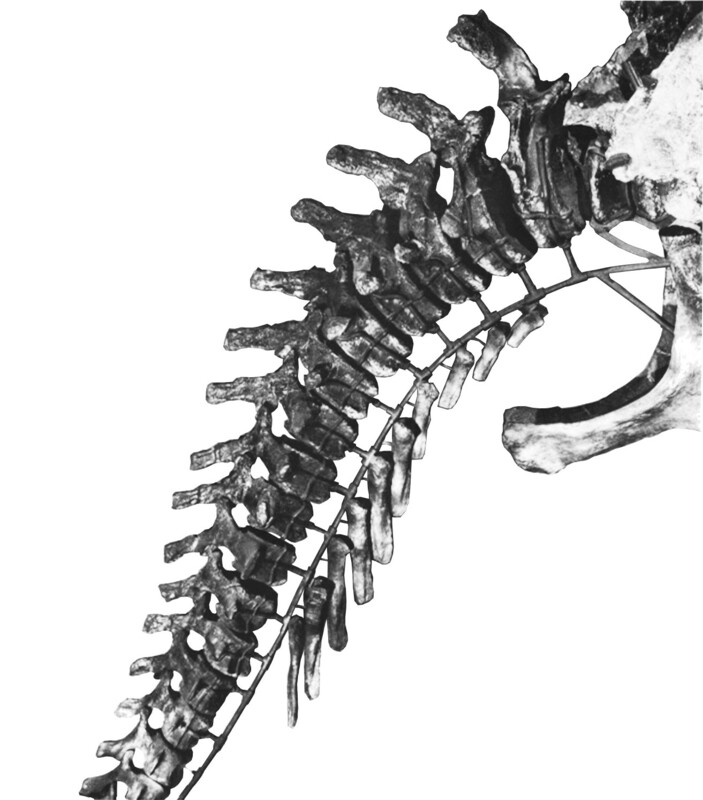 This vert has two sets of pneumatic features on the centrum: a big lateral fossa below the sacral rib articulation, presumably homologous with the same feature in S4 of the Diplodocus above; and a smaller dorsolateral fossa above and behind sacral rib articulation. Osborn, Henry F. 1904. 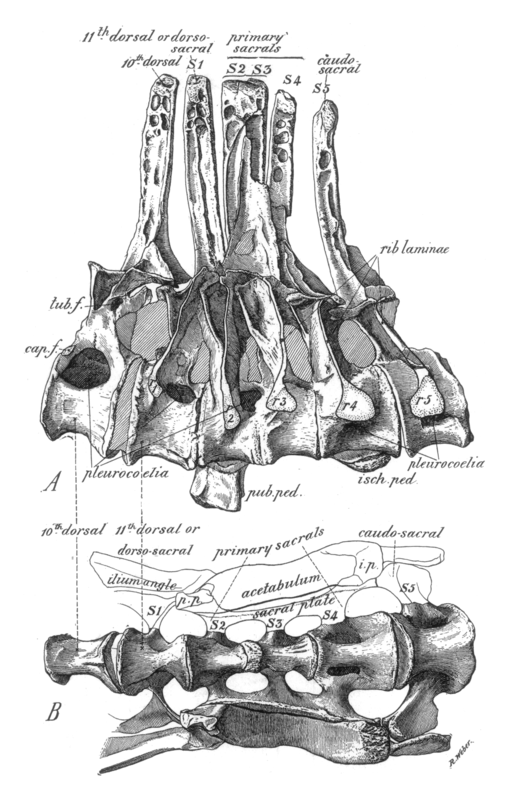 Manus, sacrum and caudals of Sauropoda. Bulletin of the American Museum of Natural History 20:181-190. Wedel, M.J. 2009. Evidence for bird-like air sacs in saurischian dinosaurs. Journal of Experimental Zoology 311A:611-628. Tired of Haplo caudals yet? No? Good – me neither. Not by a long shot. The first 14 caudals are real, the rest are sculpted replicas. You can tell in the photo because the thickness of the supporting rods drops sharply between caudals 14 and 15. That’s not my original observation, McIntosh and Williams pointed it out. Conclusion? It looks like a pretty good Haplo tail. 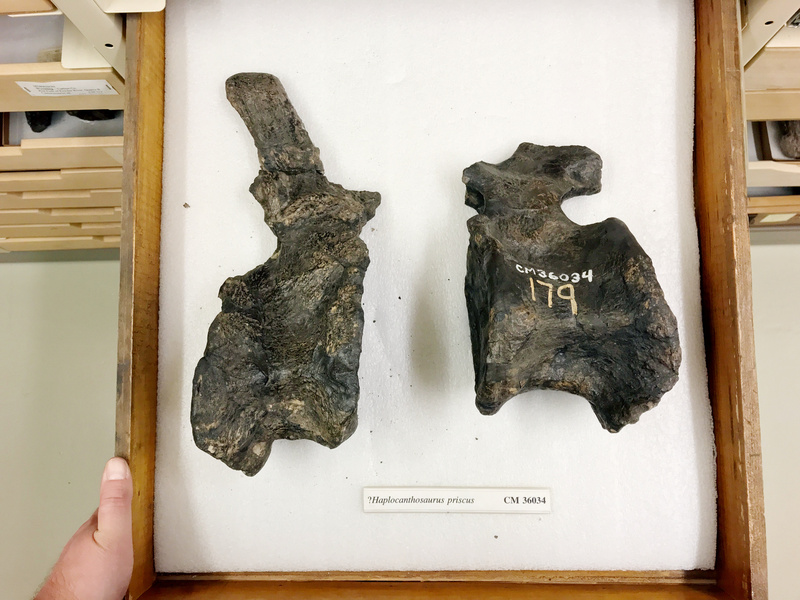 The first caudal has big, plate-like caudal ribs, which grade rapidly into the normal laterally-projecting stumps in succeeding vertebrae. 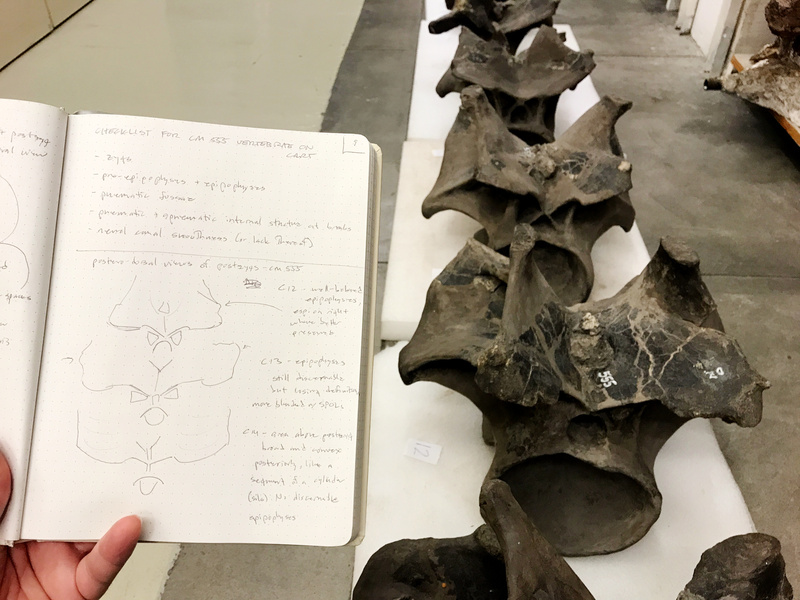 Caudal 1 also has a distinctly tall, backwardly-curved neural spine, which grades into shorter, straighter spines very rapidly as well. 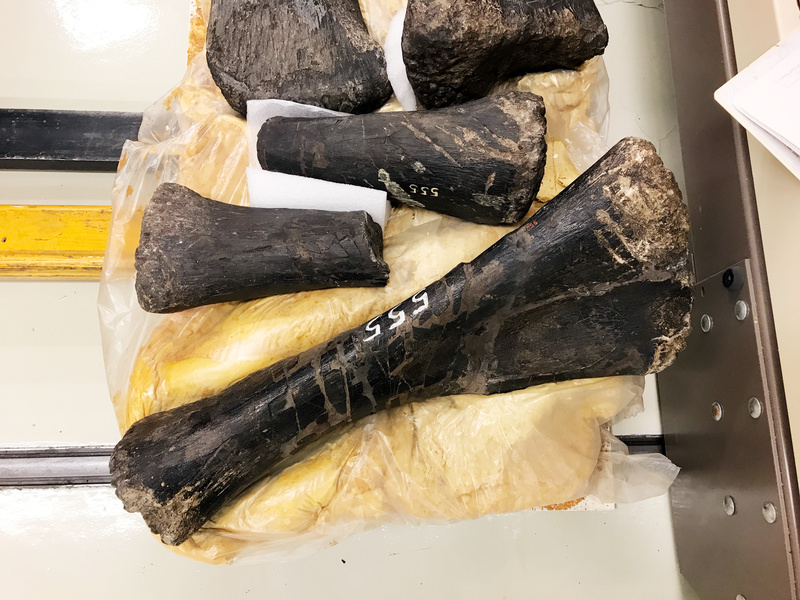 It’s as if the first caudal is built on a typical diplodocoid plan, but the rest are simple non-neosauropod or basal macronarian caudals and they have to switch over as quickly as possible. 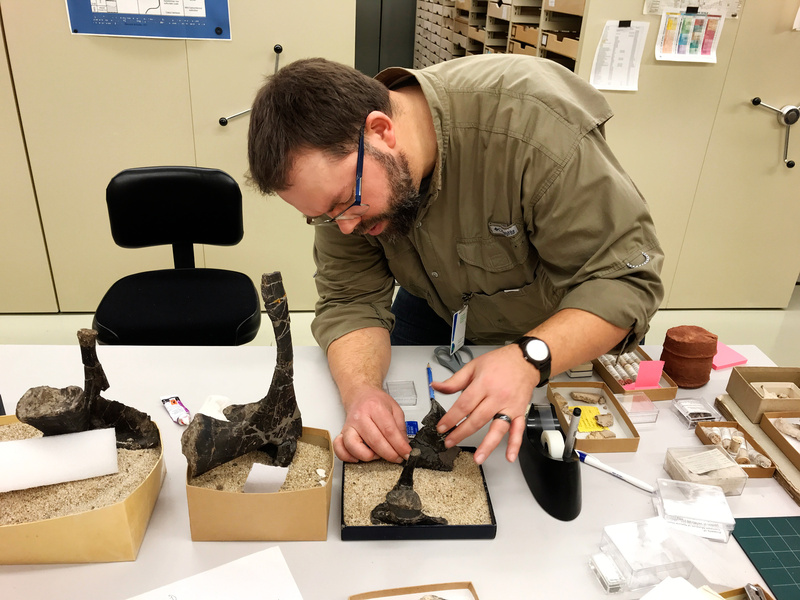 Both of those shifts happen in the first few caudals in the other Haplo tails, too, with some minor variation among specimens. I’m sure I’ll have more to say about this specimen in the future, but I’m attending the Flugsaurier conference in LA this weekend so my head is in the clouds. Hope you’re having half as much fun. McIntosh, J.S., and Williams, M. E. 1988. 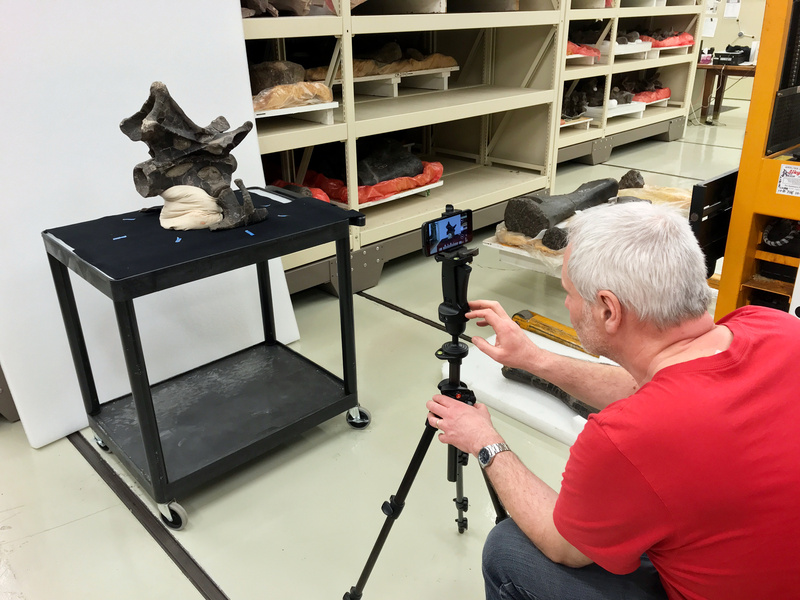 A new species of sauropod dinosaur, Haplocanthosaurus delfsi sp. nov., form the Upper Jurassic Morrison Fm. of Colorado. Kirtlandia 43:3-26.